Things in media that scared you as a kid. Tell us about things in media that you were afraid of when you were younger, no matter how silly it seems now. It can be anything, like shows, commercials, video games, etc. 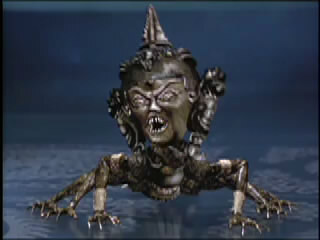 I remember I used to be afraid of Olmec from Legends of the Hidden Temple. Re: Things in media that scared you as a kid. I only joined this forum because ReDeads scared the **** out of me and I wanted to know what they were like in TP. The elephant ones from WW are hilarious now. There were loads of others, but that's the only one I still remember very well. It took me a very long time to actually confront Ganon in OoT. I saw my brother do it and it freaked me the heck out, so I avoided it for forever. ...but when I'm talking about "forever" I'm speaking in Kid Time, so it was probably only like a month or something. I've always been easily frightened by media, particularly film and games, but mostly the latter. Any game can scare me, even if it isn't intentional, especially glitches. The voices in Star Fox were unsettling to me, the transition level between the ground and sky in SMB3 made of bricks frightened me (I broke through the right wall and found a box on the other end floating there, sent chills down my spine for literally no reason and I freaked out), and plenty others. Tomb Raider and Metal Gear Solid on PS1 made me **** myself, I wouldn't leave the safety of the first area in MGS1 (where you gotta crawl under something to get past enemies and up the elevator) and in Tomb Raider (demo) it started off in a jail, and an alarm was going off and I wasn't having any of that so I tried to hide. I uh, hid in games a lot. Kinda my thing. DKC had some scary areas, like the Stop & Go levels. Plenty more I can't recall. boom boom in smb3 scared me when I was really little. A coworker usually has a "question of the day" that he asks everyone throughout the shift to get conversation going, and he asked this question a bit before Halloween. My answer was Judge Doom in Who Framed Roger Rabbit. My goodness Christopher Lloyd is terrifying at the end of that film. Also the Sonic drowning music was the scariest f***ing s*** and still gives me anxiety to this day. I think the comments section of the video (timestamped) is pretty accurate. 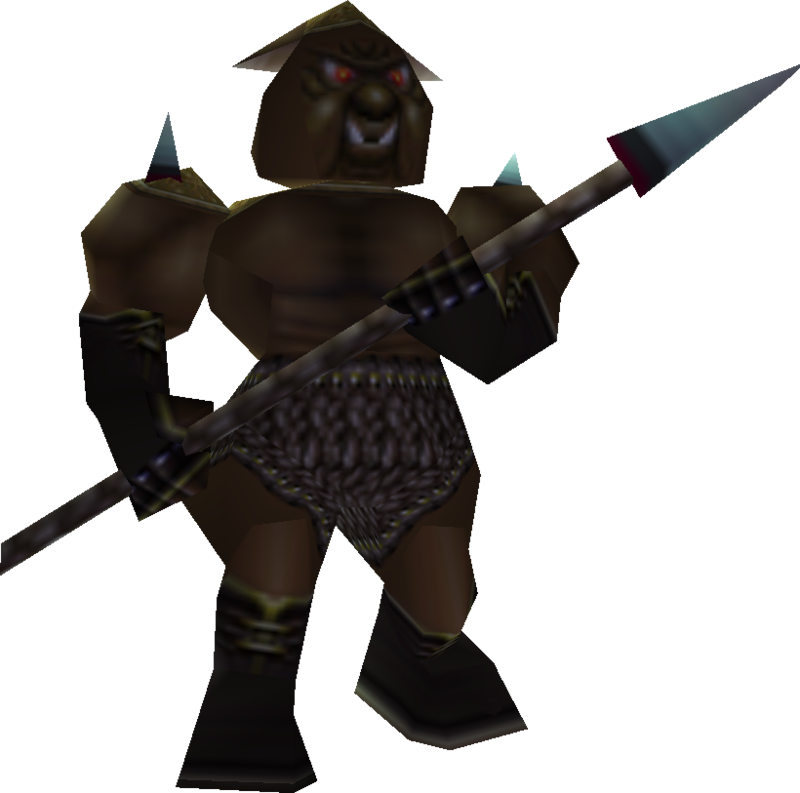 A lot of the creatures in OoT spooked me as a kid. The Skulltulas still give me the creeps for obvious reasons. In my defense, I was probably three years old. The eagle sounded like the devil to me. The "hurry up" jingle from Super Mario Bros.. The Phantos from SMB2The Angry Sun from SMB3. The drowning music from the Sonic the Hedgehog games (and by extension, any body of water). The millstone Gnawties and Rock Krocs from Donkey Kong Country. Ripsaw Rage from DKC3. The giant Chomps from Yoshi's Island. Unagi and the Mad Piano from Super Mario 64. And about a million other things. ReDeads and spiders in video games. I rarely listen to video game music because a lot of it used to freak me out with the "hurry up or you DIE" tempo. UGH!!! As for movies... I still haven't and can't watch most horror movies and will happily live my life out without seeing them. Anything that could swallow you whole in video games. Ugh. Nightmare fuel. Also, when I was really little, the MGM lion. Seeing the commercial for Child's Play with Chucky holding a knife. I had to leave my toys in my parents' closet for like a week. 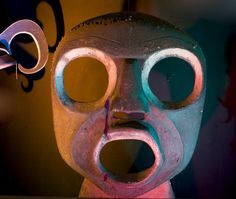 There's a display of indigenous peoples' ritual masks at the Milwaukee Public Museum. It's been there for years and years and years. Like, I've never been scared of the huge 'tyrannosaurus eating a triceratops' diorama, or the mummies, or the skull panel, but this damn thing gave me nightmares as a kid, and it's still strangely unsettling to me even now. ^That thing is way scarier than any mummy I've seen. I'm not sure how much of this memory I've got right, but I think I was staying up way later than usual one night watching tv alone when an anti-smoking psa came on. It was the party from the Wizard of Oz walking in a sneak towards the screen along the yellow brick road, and then they issued hushed warnings about the harm of smoking directly to the viewer. The Shadow Temple from Ocarina of Time - just - the entire thing. I was so scared of turning the corner of one hallway solely because I kept hearing a guillotine-like sound. The opening scene to Speed with the people trapped in the elevator scared me when I was reeeaaaallly little - like 5 years old. I was so scared of going into elevators after that. It was a well-known phase that my family remembers where I didn't want to step into elevators. I mean, you're never quite prepared for it. And it's big---------easily the size of a manhole cover. Like, people talk about being scared of Phanto in SMB2. Imagine if Phanto looked like that. Would anyone have made it past world two?